On November 8, 2014, Pope Francis appointed Cardinal Raymond Leo Burke cardinalis patronus of the Order of Malta. The former Prefect of the Supreme Tribunal of the Apostolic Signatura now has only an honorific position. The Italian historian Roberto de Mattei, in an op-ed piece published in the November 12 issue of Correspondenza romana, gives an explanation for the Cardinal Burke’s fall from favor: it is a question of pleasing the progressive German clique. “Cardinal Burke reportedly has been accused of being ‘too conservative’ and in disagreement with Pope Francis. After the unworthy report of Cardinal Walter Kasper to the Extraordinary Consistory on February 20, 2014, the American cardinal encouraged the publication of a book in which five influential cardinals and other experts respectfully expressed their reservations about the new Vatican line of thinking which is open to the possibility of admitting the divorced-and-remarried to Holy Communion and recognizing de facto unions. The worries of these cardinals were confirmed by the [Extraordinary] Synod in October, at which the most daringly unorthodox theses were even compiled in the summary of the discussions that preceded the final report. “The only plausible reason is that the Pope offered the head of Cardinal Burke on a platter to Cardinal Kasper, and, through him, to Cardinal Karl Lehmann, former President of the German Bishops’ Conference. Indeed, everyone knows, at least in Germany, that the one who is still pulling the strings of German dissidence against Rome is precisely Lehmann, a former disciple of Karl Rahner. Father Ralph Wiltgen (1921-2007, an American religious priest), in his book The Rhine Flows into the Tiber, brought to light Rahner’s role in the Second Vatican Council, from the moment when the episcopal conferences began to play a key role. “Fifty years after Vatican II, Rahner’s shadow still looms over the Catholic Church, expressed, for example, in the pro-homosexual positions of some of his disciples who are younger than Lehmann and Kasper, such as the Archbishop of Munich, Cardinal Reinhard Marx, and Archbishop Bruno Forte of Chieti. “Pope Francis spoke out against the two tendencies of progressivism and conservatism [at the conclusion of the Synod, Editor’s note), without explaining what those two labels designate. But although verbally he is distancing himself from the two poles that are facing off in the Church today, in his deeds he reserves all his understanding for ‘progressivism’, while the guillotine blade falls on what he calls ‘traditionalism’. The demotion of Cardinal Burke is meant as an example, similar to the effective destruction of the Franciscans of the Immaculate. “Many observers have attributed the plan to dissolve the Institute (The Franciscans of the Immaculate) to Cardinal João Bráz de Aviz [Prefect of the Congregation for Institutes of Consecrated Life, Editor’s note], but today it is clear to everyone that Pope Francis fully agrees with this decision. It is not about the issue of the Traditional Mass, which neither Cardinal Burke nor the Franciscans of the Immaculate celebrate regularly, but rather about their attitude of non-conformity to the ecclesial policy that is dominant today…. “And here we had thought that we would build our life on solid rock! Now we see that, on the contrary, we can live a life of authentic spiritual vitality on the sand. Let it rain, let the rivers overflow and the winds blow, let us be carried away by the turbulence of life! Is that the new asceticism? We really should be more up-to-date. A: An organization precisely calculated by the Pope, not left to chance as some would have us believe; there were other contradictory elements as well. A: Bergoglio has said repeatedly that he didn’t want to compromise doctrine, that he intended to remain in the Church’s Tradition. But then, he opened discussions, like the ones on Communion for (divorced-and-)remarried persons, which effectively touch the very foundations of the Church. A: Because by an inexorable logic, Communion for the divorced-and-remarried leads to the acceptance of second marriages (by divorced persons), and so to the dissolution of the sacramental bond of matrimony. A: There is no doubt about that. There are some well-known, prominent individuals, certainly not Lefebvrists [sic], who are making this clear. Cardinal Burke, the former Prefect of the Apostolic Signatura, was recently dismissed from his position, but not even he expresses it in drastic and antagonistic terms, because there is no movement that is a priori hostile toward the Pope. But certainly there are obvious manifestations of uneasiness…. Q: The Pope launched Kasper, he made Abp. Bruno Forte special Secretary to the Synod and during the proceedings threw his weight around, to the point where it provoke reactions from some Synod fathers. But then, finally, Francis intervened scolding both—almost like an old Christian Democrat against the extremists on either side. A: That is another recurring practice of this Pontificate: reprimands to one side and the other. However, if we want to make an inventory, the scoldings aimed at the traditionalists, the legalists and “the rigid defenders of dry doctrine” appear to be much more numerous and targeted. But when he has something to say to the right-thinkers, you never know who he is talking about. Q: The Synod also made Father Antonio Spadaro, the editor-in-chief of La Civiltà Cattolica, even more fashionable. A: Yes, he’s posing now as if he were spokesman for the Pope, and the Jesuit magazine, which had started a stubborn decline (during his tenure as editor-in-chief, while he devoted a lot of attention to the web and the social networks), is now the mouthpiece of the highest-placed people in the Vatican. Especially after the first big interview with the Jesuit Pope. While Francis’ ghostwriter is Manuel Fernandez, the Rector of the Catholic University in Buenos Aires, whom the Pope made an Archbishop. With Fernandez, Francis wrote Evangelii Gaudium, just as he had written the 2007 Aparecida document with him in Brazil, when the then-Archbishop of Buenos Aires successfully brought off the Latin American Bishops’ Conference; many think that that document is an anticipation of this papacy…. A: At times, no. 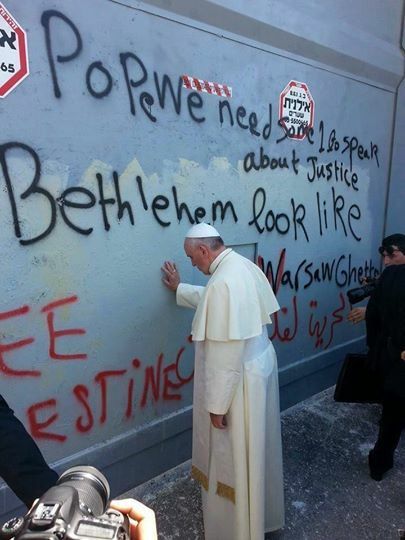 When he was in Bethlehem, he stopped in front of the wall that separates Israel from the territories and stood there in absolute silence: we don’t know what he meant by it. And in Lampedusa when he shouted “Shame!” it wasn’t clear who should be ashamed and what they should be ashamed of. Italy, which has saved thousands of lives? Why doesn’t he say it then? Often there are words and actions that are purposely left ambiguous. On November 5 the English website That The Bones You Have Crushed May Thrill imagined an interview that the Pope could grant, not to the atheist journalist Eugenio Scalfari this time, nor to the Jesuit Antonio Spadaro, but to rank-and-file Catholics. Here are a few of the questions posed by those humble faithful. We do not know what answers the Pope would give. Your Holiness, we are a year and a half into an extraordinary pontificate in which Your Holiness has certainly “hit the ground running” with a radical “programme” for the Catholic Church. When you were interviewed by Eugenio Scalfari, precisely what did you mean when you said, “I do not believe in a Catholic God”? Could you please explain your position on that? Your Holiness, in one interview you said that proselytism, or seeking the conversion of another, was “solemn nonsense”. Exactly what did you mean by this? When you said that there is a “gay lobby” and a “masonic lobby” in the Vatican, you said that lobbies are “never good”. What could be done to remove the baleful influence of these lobbies upon Holy Mother Church? Pope Francis, do you believe that the words of Christ concerning adultery, divorce and remarriage still stand and that this teaching must inform the Church’s discipline concerning Holy Communion, or have you, in the words of the LCWR (Leadership Conference of Women Religious), “moved beyond” the Lord Jesus Christ? Your Holiness, I am glad you mention “mercy” so regularly. What was your motive for what in all essence appears to be the demotion of Cardinal Burke, a highly approved and esteemed Cardinal, who Pope Emeritus Benedict called “a great Cardinal” of the Church? What is your motive in doing this, while keeping men who espouse doctrinal positions against the Church’s perennial teaching, like Cardinal Kasper and Cardinal Richard Marx, as close confidants? Despite all these uneasy questions, at the conclusion of his analysis, which we cited at the beginning of this press review, Roberto de Mattei reminds his readers: “Even if the Society of Saint Pius X had not existed, if the Franciscans of the Immaculate had not been dissolved or ‘reeducated’ and if Cardinal Burke had not been reduced to silence, the crisis in the Church would not cease to be serious. The Lord promised that the Barque of Peter will never founder, not because of the pilot’s skill, but through the divine assistance offered to the Church, which lives, we might say, on a stormy sea without ever allowing herself to be submerged by the waves (Mt 8:23-27; Mk 4:36-41; Lk 8:22-25). This entry was posted in Uncategorized and tagged Cardinal Burke, CARDINAL KASPER, Cardinal Raymond Leo Burke, Cardinal Reinhard Marx, CARDINAL WALTER KASPER, Pope Francis. Bookmark the permalink.